Thank you for your interest in Saanen goat breeding stock from Redwood Hill Farm , which includes the Compañeros, Sartyr, and Vineyard View herds. 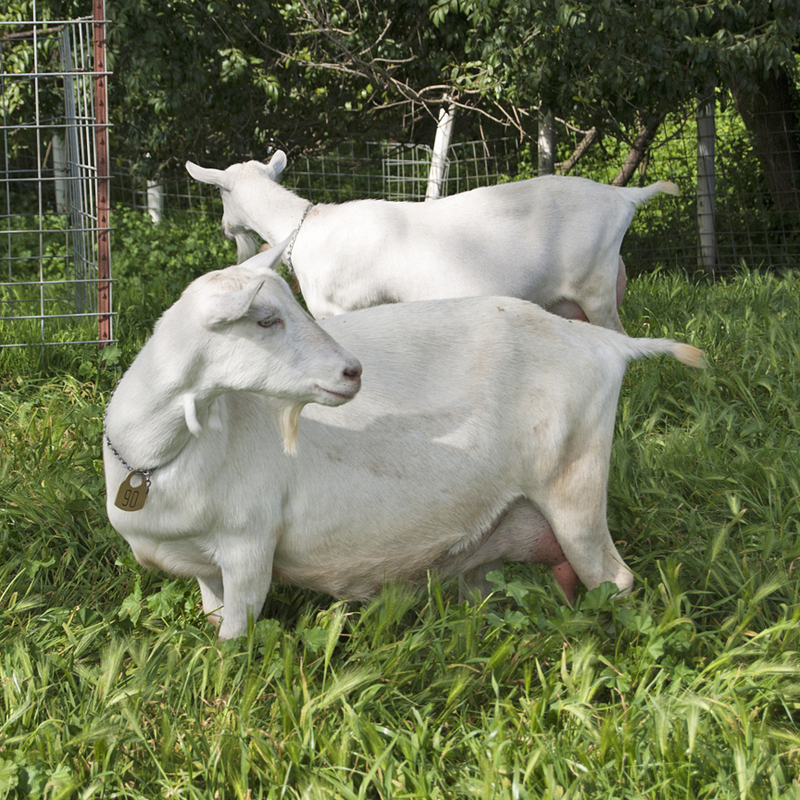 Although we have three Saanen goat herds living here at Redwood Hill Farm, they share the same motto “The Winning Combination of Milkability and Showability” and are genetically related. In 1978 Jennifer Bice and Steven Schack became goat business partners and Steven’s Compañeros herd of dairy goats came to live at Redwood Hill Farm. Although Steven raised four breeds of dairy goats, Saanens were his first love and where he received the most recognition. Compañeros was a force in redefining the Saanen goat breed in the 1980’s with many outstanding animals, such as SG Compañeros Voice of Reason who has had 18 permanent champion offspring, including ADGA National Champion Compañeros Reason Jezebel. In the 1990’s the White Wave herd of Jennifer Jackson became a part of the Compañeros Herd along with bucks SG Heavenly-“Poor” FRM Prime Rate and his son SG White Wave Katsuo. These two bucks have been instrumental in increasing milk components within the breed. In 1985, employee Steve Considine gave Steven Schack a kid bearing the Sartyr herd name in exchange for breeding fees. That doe had a kid named Compañeros Jaison Ophelia, which started the Sartyr herd of Steve Considine that lived at Redwood Hill Farm. All of Steve’s goats today trace back to Ophelia, including his “T” line that has produced two National Champions and is greatly influencing the Saanen goat breed. The Vineyard View Saanens are owned by Scott Bice, and although pretty new to the Saanen scene, have enjoyed great success. At the 2015 ADGA National Show, Vineyard View had the Reserve National Champion with Best Udder, 1st place Best 3 Females, 1st place Dairy Herd, and 1st place Senior Get of Sire. The 1st place Senior Get of Sire and Premier Sire of Show for Saanens was SG Loughlin’s Voice of a Sly Fox, fittingly a SG Compañeros Voice of Reason son.